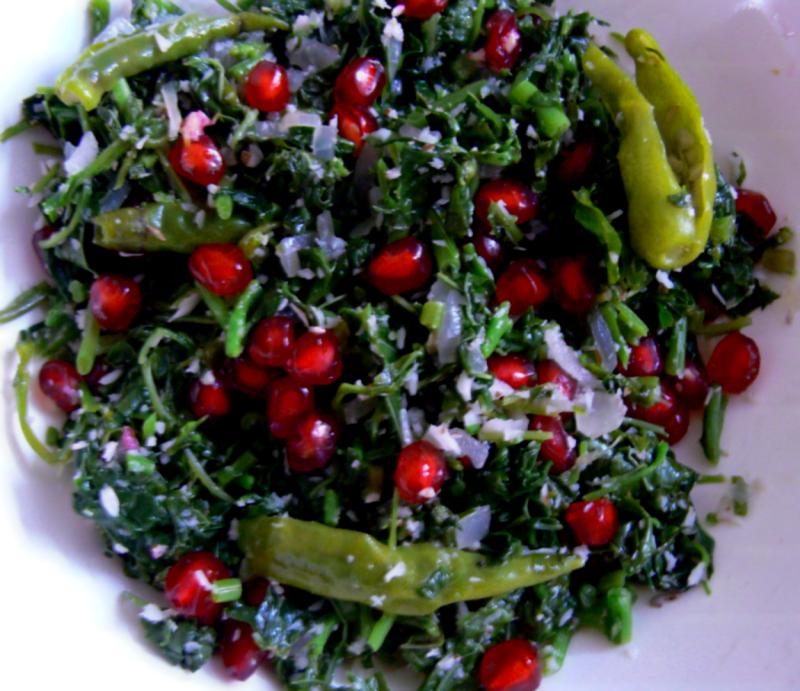 Both (greens and pomegranate fruit) the ingredients are highly nutritious.This Pomegreat-Greens Salad is an easy 'n' tasty one which needs 5 mins microwave cooking-time.Kids will luv the crunchy pomegranate seeds taken with greens. Take a microwave bowl. Add salad oil,chopped onions,cumin seeds,chopped Greens,Ground pepper corns,salt,1/2 cup water and coriander leaves. Microwave this on high for 5 mins or till water runs dry.Take the bowl out. Mix the grated coconut well with the Greens Salad. Finally add pomegranate seeds before serving this and mix this salad well. Healthy Crunchy Pome greens salad . A novel dish . Will surely give a try . Thank U .